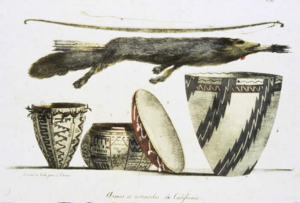 California Indian baskets were written about and collected by the first Europeans who invaded California. The baskets were objects of beauty and utility. Indian basket weavers demonstrated extraordinary artistry and expertise when they made these baskets and that tradition lives on as contemporary basket weavers create new works of art. 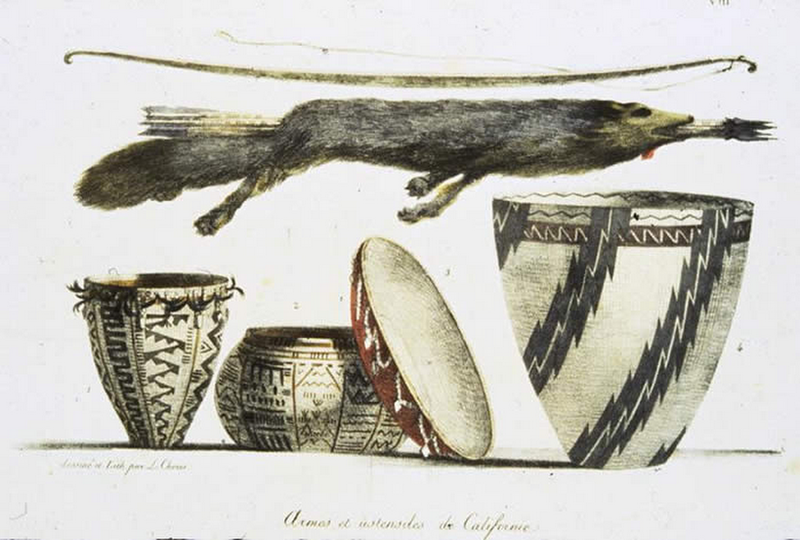 Baskets are among the best-known items made by California Indians. While they can be admired as art forms because of their exquisite appearance, they were made to be used. Throughout California, baskets were an integral part of Indian households. Any given family had upwards of 20 different types of baskets, which served a variety of utilitarian functions: food gathering, storage, processing, cooking and serving; cradling babies; general storage; animal trapping; carrying wood and other items; and gifts and mortuary offerings. In some areas they were used as bottles, elements of ceremonial regalia, hats, baby rattles, and game implements. Baskets are no longer necessary for survival, but they are still made by some as an expression of cultural heritage, as an enjoyable past time, as something to be used, and something to be treasured…Whether old-style or new, each basket shows tremendous skill, time, patience, and caring on the part of the maker, skill which elevates basketry well beyond the level of a craft. While some openwork baskets can be woven quickly, most baskets cannot. Often, the plant materials used in the basket must be harvested well in advance of actual weaving. Depending on the plant species needed, burning or winter pruning may be necessary to ensure long straight shoots and vigorous growth, or careful digging techniques to ensure long roots and rhizomes (underground stems). In the latter case, a sandy loam soil is needed for roots and rhizomes to grow straight. Currently, access to native materials presents difficulties to those still practicing and teaching basketry and other skills. There are many stories to tell about a favored collecting site, sometimes used by the same family or group for generations, now fenced off, built upon, buried under the waters of a reservoir, destroyed by creek channelization, or bulldozed out of existence. Sometimes such stories are old, but they are also about the day before yesterday, today, and tomorrow. Despite these and other difficulties, basketry and other such skills continue within the framework of modern life. Sources: Archives of the Museum of the San Ramon Valley, “California Indian Basketry” by Beverly Ortiz in East Bay Regional Park District Log, Dec. 1988.